The agave makes a pretty, if prickly, addition to your garden. Their low water needs and tendency to thrive in nutrient-poor soil makes the agave a perfect addition for your rock garden. Agaves are desert-dwelling plants that will grow in USDA plant hardiness zones 8 to 11. Transplanting a large agave may require heavy equipment and extra hands, but a small agave is easy to move as long as you are careful not to poke your self on the sharp and painful spines. Loosen the soil around the root ball using a garden fork. Drive the fork into the soil and lift up, loosening the roots in the soil on all sides of the plant. Loosen the soil in the new planting site by turning it over with a garden fork. If the soil is heavy and claylike, add coarse sand and peat moss to create soil that will drain well. Agaves need well-draining soil to prevent root rot. Remove the root ball from the soil using a shovel or garden fork. It is OK to cut off some of the roots but leave at least two-thirds of the root ball intact. Move your agave to the new prepared location; for larger plants, a wheelbarrow might be necessary. Dig a hole that is slightly larger then the root ball at the new planting site. Place the agave plant in the hole so that the base of the plant is level with the ground. Fill in or remove dirt if necessary. Fill in the soil around the root ball, add a few handfuls and then pat down the soil to avoid air pockets around the roots. Air pockets can cause the roots to oxidize and rot. Water your newly transplanted agave so that the soil is damp down to a depth of at least 5 inches. Agave plants send out "pups" from the root ball. These can spring up right under the mature agave plant or can be found as far as a foot away. Cut off one of these pups 2 inches below the soil line and lay it on a newspaper in the shade for three days. Plant the pup in a pot or in the ground to propagate your agave plant. 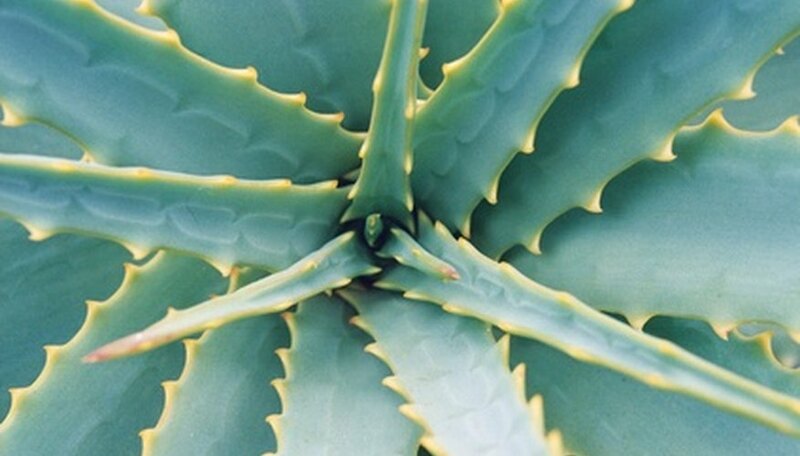 Agave plants have sharp spines that can cause serious damage if handled improperly. Protective eyewear, gloves and clothing is recommended, particularly for large plants.